- because we need an offline world too! Reading rc airplane magazines and books about radio control flying shouldn't be seen as 'old school' in this online world that we live in today. In fact, a magazine subscription is an excellent way of making sure you're up to date with this rapidly changing hobby. Popular aeromodelling magazine choices such as Model Airplane News and Backyard Flyer are invaluable sources of information, both for the newcomer and the seasoned enthusiast. And an annual subscription offered by online magazine suppliers and publishers will often save you anything up to 50% off the price of buying each magazine separately over the course of a year. I personally subscribe to RCM&E here in the UK, I believe the North American version of the same magazine is called RC Model Aeroplane. Aside from that one, the rc airplane magazines shown below are equally as popular (Model Airplane News being the most popular) and are all available from Amazon. Some great rc books are listed further down the page. Model Airplane News is one of the longer running publications and one of the most popular, covering all aspects of the hobby. This top magazine is always loaded with high quality articles from flight training to engine tuning, reviews on various products whether it's a new kit or a new rc system, and excellent photography. Model Airplane News would be a very sensible first choice for anyone already involved with or about to take up the hobby of rc airplanes. Extract from a MAN reader review: "The price is just right, the editorial, product reviews, how-to's and pics are all amazing, and the subscription is a breeze. This magazine is for everyone, from beginners to pros..."
Electric Flight (previously Backyard Flyer) conveys the fun and excitement of flying Park Flyer type electric RC airplanes and other EP aircraft by showcasing the diversity of new products and offering useful how-to information. Crafted to ensure success, the magazine features totally new, close-to-home flying environments and energized writing that inspires beginners and seasoned modellers (editorial description). Extract from an Electric Flight reader review: "This is a great magazine for the beginner RC pilot wanting to fly for fun in restricted spaces... Its articles are easy to read and reviews of various backyard flying airplanes fill the pages..."
Fly RC magazine presents the latest radio control products, technology and techniques each month. With articles for newcomers and experienced modellers alike, Fly RC covers indoor micro airplanes, park and school yard electric flyers, sport glow aircraft, giant scale gas and exotic "project" airplanes, as well as the latest news on Li-Po batteries and brushless power systems. Extract from a Fly-RC reader review: "It is often difficult to find a trade rag that gives honest reviews of products, but Fly RC has stepped up to the challenge and provides a quality rc airplane magazine that is informative and has honest reviews of products..."
Getting Started in Radio Control Airplanes by Gerry Yarrish. 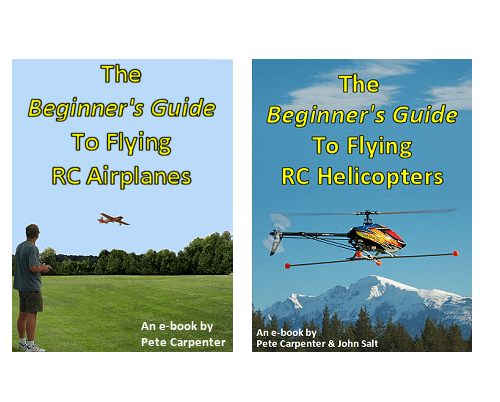 Editorial description: "The most comprehensive and up-to-date book answers all of the beginning hobbyist's questions about building and flying rc airplanes. Step-by-step techniques and are illustrated with a wealth of photography and cover all the basics, from choosing and building a first model to covering and finishing it, understanding and installing glow engines, flight basics, and much more." See the book in detail. R/C Pilots Handbook also by Gerry Yarrish. Price for both e-books: only $25.00.